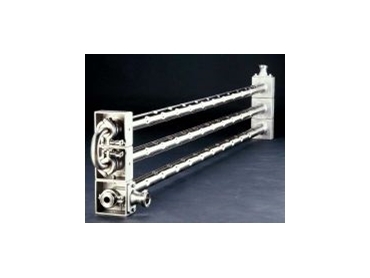 THE range of Dimpleflo tubular heat exchangers produced by Teralba Industries is now available with titanium tubes. This means Dimpleflo Modular heat exchangers, which are used to process viscous, slurried and fouling fluids, can now be used to heat or cool very corrosive products. Dimpleflo tubular heat exchangers, designed and manufactured in Australia by Teralba Industries, are available in a wide range of sizes and configurations including "tube in tube" and "shell and tube" designs. This flexibility in heat transfer design enables Teralba to meet clients specific functional or dimensional requirements. Dimpleflo units are now available in full titanium construction where corrosive products are both sides, for example, energy recovery. A more cost effective alternative, where a corrosive product is being heated or cooled by conventional means, for example water or steam, is to use titanium inner tube and elbows, and stainless steel jacket. The photograph shows a 3-tube Dimpleflo Modular heat exchanger with titanium inner tubes and 180° bends, with all other components 316 stainless steel. The inner tube cools 540L/h of nitric acid from 115°C to 25°C using 5760L/h of 5°C chilled water in the jacket.